The last post of November just so happens to be the last review of November, too. It's for a game I was excited about playing, but then again, I get excited about playing anything. Maybe I have some sort of problem? ...Naaaaaah! Here's my review of Super Smash Bros. for Wii U. Do U even smash, bro?! Like many anticipating the newest console release of Super Smash Bros., I used the Nintendo 3DS game as a bit of an appetizer to the main Wii U course. While the handheld Smash Bros. was competent and a roaring good time, it lacked some of the basic necessities that has fans returning to the series time and time again. For one, the controls weren't perfectly suited for the Nintendo 3DS and two, the single player content left a little more to be desired. Now that its big brother, Super Smash Bros. for Wii U, has released, not only is the game better than what the Nintendo 3DS offered, but it's close to the best the Super Smash Bros. series has seen yet. While one could enjoy local multiplayer with the Nintendo 3DS version, for a party of four players, each needed a copy of the game and their own Nintendo 3DS console. It wasn't the easiest setup. With Super Smash Bros. for Wii U, all you need is a TV, a copy of the game, a Wii U, and four controllers. The Wii U GamePad and Pro Controllers obviously are compatible with the game, but so are pretty much every other controller that works with the Wii U works with Smash as well, including the Wii Remote, Classic Controller, and even the Nintendo 3DS. With an adapter, Smash fans still clinging to how they enjoyed Melee in 2001 will find that GameCube controllers even work for this edition of Smash Bros. as well. I never knew Kirby was into break-dancing. I mentioned four controllers as what one would need for a nice session of couch multiplayer. 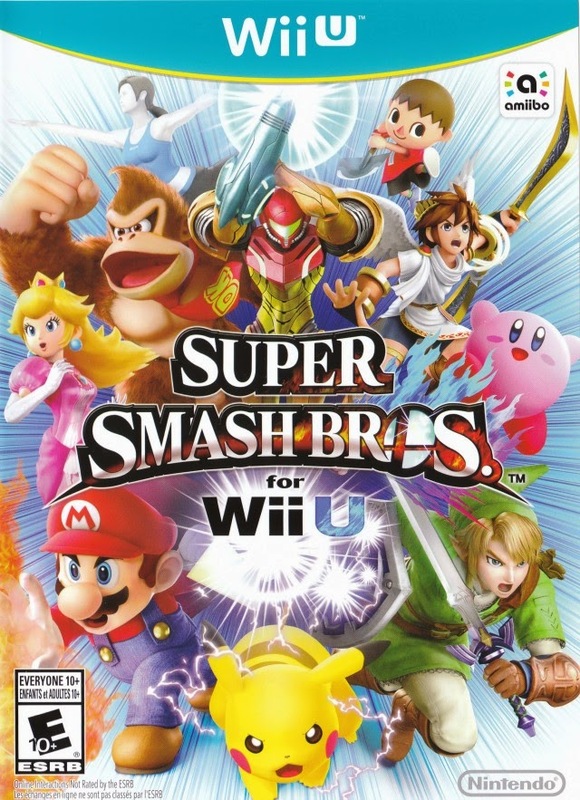 However, Super Smash Bros. for Wii U offers for the first time in the series up to eight players in one match, brawling it out simultaneously. Things can get a little hard to see in such scenarios, especially in the larger stages in the game, as the camera zooms out really far, but overall, the experience is a welcomed one, if not a total novelty. The catch with 8-player competitive play is that the number of stages that can be played on is much more limited. a decent selection of stages. And how about those stages, by the way! Super Smash Bros. for Wii U without question has the most amazing and cleverly designed stages in Smash Bros. history. Some personal favorites of mine include an innovative concept for the series, a stage that features battles on the foreground and the background. This Donkey Kong Country Returns inspired Jungle Hijinks stage presents combatants with barrels to blast them from one plane to another. The background is riskier to do battle on, as players are launched much more easily here. ...And there's no DK barrels nearby!" Then there's Star Fox's Orbital Gate stage. It's here where combatants battle aboard a bevy of different platforms, such as the Great Fox, Arwings, and missiles, all the while fighting in the heart of a battle between Cornerian forces and the alien Aparoid army. in outer space. He is a star after all. It is all too easy to get caught up in how many of the 46 stages delight, such as the Mushroom Kingdom U, where Kamek transforms the stage into various locations from New Super Mario Bros. U; Wuhu Island, which has a platform that shuttles you around multiple hot spots on the well known Wii Sports Resort locale; and the wide open expanses of Gaur Plains. Gah! See right there? I got caught up in the stages being great anyway! Two newcomers with swords prepare to duel. Anyhow, while there are an abundance of new stages, a multitude of what is unlocked are past stages from other Smash Bros. games, mostly from Melee and Brawl. All stages can be played in For Fun or For Glory modes-- the latter of which has battles which take place on a totally flat platform with a bottomless pit on each side. This mode is meant for more competitive players who don't want to trifle with items or cheap K.O.s. Super Smash Bros. for Wii U delivers on the single player front as well. While Smash Run from the Nintendo 3DS version is missed and would have made this Wii U game's solo content almost perfect, what's there to offer for players is terrific enough. However, let's get the dud mode out of the way first. Smash Tour is a Mario Party / Fortune Street-esque board game where through everyone moving at once, tries to build a team of fighters for the final round of the mode. 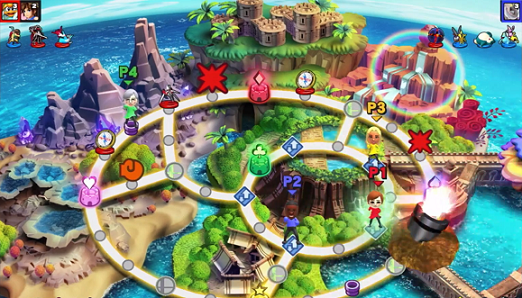 Players can steal others' fighters through various means, but even with knowing the majority of the rules that goes on in Smash Tour, the mode can still be quite overwhelming. I know that even when playing Smash Tour in a multiplayer setting, most of us just wanted to do some normal Smash battles instead of this lame duck of a mode. is common with Smash Tour. Regardless, the other modes allow for a much better time. In the Wii U edition of Super Smash Bros., Classic and All-Star aren't just limited to solo play. Now, another player can join you, making your battles through hordes of video game all-stars all the more engaging and entertaining. You even get two trophies for the price of one for completing each of these modes with two players. The two really cool and wholly awesome modes for solo play starts off with Event mode. Like past Super Smash Bros. games, you play through mission after mission, each with their own set of rules and unique challenges. Some might task you with protecting an AI partner, while others require you to perform your final smash on a foe to end the match. Each event has its own requirement to get a bonus prize, such as beating the event under a certain time or simply beating an event on a certain difficulty. The latter solo mode is called Special Orders. Master Orders has you selecting between three challenges to win nice prizes. Crazy Orders, requires you to bet money or use a crazy orders pass to participate in a series of battles. The further you progress, the more you earn. However, if you lose any of the battles, you lose a fair number of your prizes. The strategy here is to know when to quit and take on Crazy Hand in a survival showdown. Win, and you're able to claim all of your prizes without any other hassles. Crazy Orders is a sensational way of earning mad bank, and it offers a great challenge, as you're not healed by a lot in-between battles. if it ain't got that swing. If you're all by yourself and want to play against someone that isn't just the very capable AI, then hop online for some Smash Bros. action. Fights can be fought in either For Fun or For Glory modes, and the lag in battles depends on a multitude of things. For instance, I have found that a wired connection is much more reliable than a wireless one. Even still, sometimes fights do become a little laggy at times. That said, it's nowhere-- and I mean nowhere-- as awful as the netcode that the Wii's Super Smash Bros. Brawl had. Still, even with battling against friends, there's no voice chat during play. It would have been nice to see some kind of voice chat during online contests instead of only in lobbies. And Little Mac comes in with the haymaker! Outside of super smashing some bros, there is a lot of bonus content to be found in Super Smash Bros. for Wii U. Firstly, there is a list of 140 unique challenges that can be completed in order to earn prizes. Some of these challenges are insane to even think about trying, much more actually doing them. Then there are an abundance of trophies which are modeled after various video game characters, enemies, objects, and places, each with some intriguing (and sometimes humorous) info alongside them. Lastly, there is a (bare-bones) stage creator, plenty of music tracks either new, remixed, or from their original games (over 400 tracks total), and the ability to take photos during gameplay and save replays of your favorite battles. Uh... no one ordered crab, did they? Super Smash Bros. for Wii U delivers one of the most amazing multiplayer experiences on any platform, whether you're a fan of local competitive couch play or online competition. Even without friends to play with, Super Smash Bros. for Wii U is redeemed by having an immense amount of content packed into one disc-- so much so that it will take hundreds upon hundreds of hours to unlock and complete everything the game has to offer. Regardless of whether this Smash is the best of the bunch to date, know that if you're a fan of addicting video games with loads of content to last you long into the new year, you NEED Super Smash Bros. for Wii U.